We sell a very large range of internal bifold doors with varying designs so we have something to suit everyone’s tastes. We have three different types of internal folding doors, the Roomfold Standard, the Roomfold Deluxe and the Roomfold Grande. We decided to create a list of the best internal bi-fold doors we offer. These doors have full-length clear glass panels and are surrounded by oak. They are one of the most popular styles of bi-fold door, mostly due to the fact that the set can be decorated or stained to the colour and style that you prefer. This standard system is available in either 3 or 4 door sets, and are offered in a large range of styles so you should be able to find one for your room. They are also offered with no floor track, this means that the whole room can have a seamless floor, without a track in the middle. It also means that you don’t have to worry about installing a track. 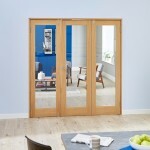 To go with our Mexicano internal door range, we also have the Mexicano internal bifold door. These doors have a cottage door style. You get the advantage of being able to shut a room completely off and with high-quality folding doors. If you have the Mexicano internal doors too, you can match your doors, showing how much attention to detail you put into the interior of your home. These doors don’t use a track along the floor either, but the upper track still provides you with a smooth folding door. The Mexicano range uses only the best unfinished solid core engineered oak doors. These doors are created with high-quality white primed finished with clear toughened glass, helping the door achieve its contemporary look. Due to the clear glass throughout the door, it allows you to shut off the other side of the room while still being able to see through. These doors come in many different sizes and are available in 3, 4, 5 and 6 door systems so you have plenty of options to choose from. These doors have more of a traditional style, using glazed unfinished oak with clear toughened safety glass. These doors are very simplistic but still look stylish and they let the light flow through the room seamlessly. The Aston doors are available in 2, 3, 4, and 5 door systems and can also be adjusted in both height and width to fit the non-standard door openings. They comes without the floor track again, however, the head track still allows your door to run smoothly. If you’re looking for a more contemporary look for your rooms, these are definitely the bifold doors for you. 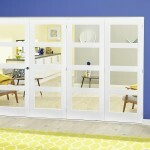 These deluxe doors offer a patterned solid white primed door, with 4 frosted glass panels per leaf. It is great to be able to close off a room off and then be able to open it all up, that’s exactly what these doors do. They come with both a head track and a floor track, both help make sure that the door runs smoothly across the room. These particular RoomFold doors are available in 3, 4, 5, and 6 door systems so there’s bound to be one for your room. 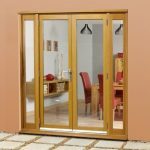 If you’re looking for some bifold doors that can also match your other interior doors, these might be the right bifold doors for you. The York Oak doors come with both a head and base track, this tends to be most common when the doors become longer. They are available in 3, 4, 5 and 6 door systems, and come in a large variety of leaf sizes, this allows you to choose the best sizes for your needs. If you still cannot find one to fit your door frame, these doors are adaptable and can be adjusted by the width and height a fair bit. The Lincoln Oak doors are also offered as more of a traditional range of internal doors. They are made with unfinished glazed oak and clear hardened glass. They are available in 3 and 4 door sets, meaning they’re not our biggest door, however, the stylish door makes up for it. Also, if you’re looking for a door that you have without fitting a base track, this type of door might be right for you. The sets are also reversible, meaning you have the doors open whichever way you’d like. They start at 533mm for the door leaf size, and go all the way up to 686mm wide, this means you should be able to find one for your door frame. This prefinished door set means that they are ready to install straight away, without any decorating. These doors are offered with a solid core, engineered oak and clear glass door panels. These are available in 3, 4, 5 and 6 door sets, giving you an amazing range of sizes to choose from. Again, if you don’t find the exact size you need, these doors can be trimmed a little to fit your door frame. Be sure to have a long look through all of the sizes beforehand, though. The oslo doors are also provided with prefinished engineered oak with strong clear glass. 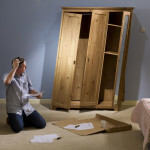 This means that once they arrive, they can be fitted straight away, without having to decorate anything. The doors have narrow horizontal lines through the glass, this still lets the light flow through the room. These RoomFold doors are from the Standard range, so they are available in 3 and 4 sets, but still come in a variety of sizes. These doors don’t need a floor track either, so they allow you to still have a seamless room. This set is also reversible, so you can decide which way you want your doors to open. This walnut set offers a contemporary styling which is becoming rather popular, especially in modern homes. This set is made from toughened clear glass with a warmer colour wood. Explaining why its name is Walnut. The colour is known to make you feel warmer, as the colour is warmer whereas the glass still allows the light to pass through the rooms. As the door, doesn’t need a floor track, they can be put on any materials and if the door is a little too big. The doors can be trimmed a little if done properly. There are our top 10 internal bifold doors. We wanted to make sure there were lots of different styles of doors, as well as colours. So, everyone could find a door for them. 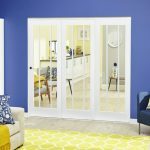 What is the Difference Between French Doors & Patio Doors? Bifold vs Frenchfold Doors – Which One Will You Choose? 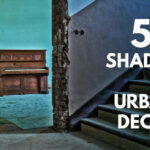 This entry was posted in Buyer Guides on 7th March 2017 by Climadoor.